In the wake of the ten volume, three million word Malazan Book of the Fallen, I was running on empty. That was a strange feeling: no desire to write, no raging flames of creative passion. And though I had signed for two more trilogies and still had four or five Bauchelain & Korbal Broach novellas ahead of me, I just pissed around for like, two weeks. Now, I’d begun foreshadowing the new Kharkanas trilogy a few books back, beginning with some flashback scenes in Toll the Hounds. And I had the titles: Forge of Darkness, Fall of Light, and Walk in Shadow. It looked cozy, manageable: straightforward in the way that only prequels can be. 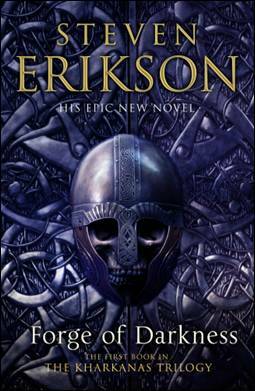 Thing is, with the Malazan Book of the Fallen, I’d kinda torn up the borders – the series sprawled, the breadth of the world-building (in conjunction with co-creator Ian C. Esslemont) was, well, insane. Even we knew that. It made us laugh (okay, an evil laugh). It would’ve been easy to plunge into the Kharkanas trilogy using the same style, the same voice, the same everything, as I’s used in the Malazan series. I’d mapped those ruts down to the molecular level. But that was the problem. What’s the point of creative resurrection if it’s the same old thing? When discussing the Malazan series, I talked here and there about ambition, railing against the notion of the word being an effing pejorative. Good enough. But I’m too old for that kind of ambition, or at least that’s how it felt. If the Malazan series sprawled outward, why not take the Kharkanas trilogy inward? Scale it right down, as close to claustrophobic as I could make it. For that, I realised that I would need a different voice, a different style. The way I figure it, if you’re going to seek inspiration, why not look for the best stuff that’s out there? And by that I don’t mean what everybody’s salivating over this month, or this year. I mean, the best stuff ever. For the Malazan series, I found inspiration in the Iliad. Gods and mortals crapping all over each other, and all that. For the Kharkanas trilogy, which now loomed in my mind as some whirlpool, a devouring spiral to some dark, unlit core, I went and re-read the collected plays of Shakespeare. Took me three weeks (and what a glorious three weeks that was: no deadlines, no pressure to get in my four hours a day of writing. Just reading. Bliss). Now for me, inspiration’s a strange thing. It doesn’t like details, or specifics. It’s not into copying, or even riffing. It doesn’t even like obvious echoes, literary allusions – that old wink of the author’s eye to some exclusive, knowing subset of the readership. Instead, it arrives like a tapeworm, munching away somewhere in my gut. For me, it’s all about absorbing cadences, style and structure. With Shakespeare, it was all about declamation. Which, presumably, is born of the stage, going back to the Ancient Greeks and, before them, to high priests and high priestesses, warlords and the like. I fell in love with declamation, and sentence structures dictated by breath-length. All the stuff we don’t really do any more. Follow this link to read the whole piece!